Can you believe it? This little blog of mine is already half of a decade old and though it might not feel like its been as long or feel as though like I've accomplished half of what I wanted to so far, I actually have done so much and have felt so inspired with and through this spec of a space. It's blessed me and my family in so many ways both internally and externally, in and outside of our lives and I can only hope its helped you in one way or more. Its allowed me to step outside of my bubble and given me quite a few fun and learning opportunities but the best part, its also given me the opportunity to meet so many amazing fellow bloggers, influencers and so many of you I now call friends. The funny thing is I didn't think I would still be so inspired to be blogging after all this time, but I think I'm more inspired now than ever before. Whenever I begin a new endeavor I tend to get bored very easily but not here and not this time because here I can't help but feel so inspired daily. So I want to keep working hard to keep sharing what I love, keep myself open to more opportunities and keep the ideas flowing and in the process help support myself and my family if I'm able to. That has now become the goal because I now know that this is what I want to keep doing. Even without those financial opportunities, that's not what drives me to keep sharing on my blog because first and foremost, its YOU who drives me and who keeps this blog ALIVE! You are the reason I do this, the reason I blog, the reason I share, you give me purpose, you keep the motivation flowing. Anyway, but before I go and get all mushy on you guys let me just say; though I feel that this space serves its purpose for me, at the end of the day, your opinion matters most because you're the reader. So tell me, does it serve its purpose for you? I'd like to ask a favor, I'd like for you guys to tell me what more or less you want to see on the blog. 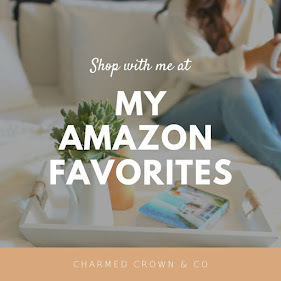 Please share your feedback with me by filling out the Q&A survey below and tell me how we can make Charmed Crown & Co better for you and me.